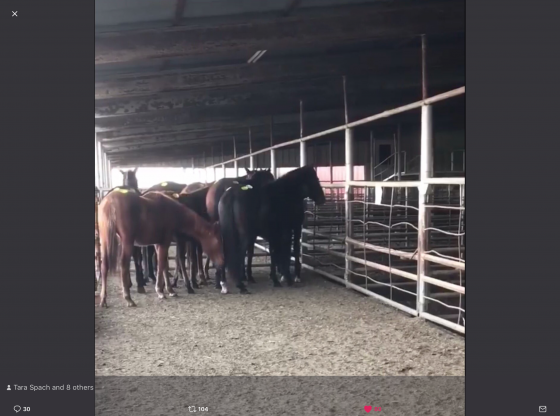 These horses are/were in a kill pen in Bowie, Texas and we are having to bid to free them tonight. A poster — someone who follows what is happening and then puts it out in social media — was alerted to their plight and then alerted us. They were to ship that same night, so time was running out. One of them, it was reported to us, was still wearing his racing shoes which means he was raced very recently. Charles Oldham committed $15,000.00 to cover all the expenses for all of this herd of nine and facilitated their immediate release. Now on safe ground in a Louisiana quarantine facility, their 30 day hold is nearly up. thirty days. These horses will be together forever: THEY ARE A FAMILY. THANK YOU to ALL WHO CALLED OR WROTE. We would appreciate those who want to assist in doing so so we can continue rescuing SLAUGHTER BOUND HORSES. Remember: our focus is education and not rescue. But we will go where we’re lead and there are 20 more horses in jeopardy at the Thompson Feed Lot in Louisiana. REMEMBER: We’re here to help! Call us Night or Day at 877-819-7776 extension zero. God bless all of you!